We are committed to maintaining the trust and confidence of our customers and website visitors. Protecting our customers is at the heart of everything we do at Custom Tape LTD and protecting your information is no exception. We want you to know that we are not in the business of collecting unnecessary data, or selling, renting or trading email lists. We prefer to focus on offering an unrivalled quality of tape with competitive prices, whilst delivering a fantastic service. The aim of our website is to make it easy for you to find and enquire about the packaging you need, so you can get on with the rest of your day. We want you to have the best experience possible, so we use session cookies to enable you to pick up where you left off, and we use software to analyse and help us to improve our website. Our contact form allows us to deliver tailored customer service, and allows us to contact you to answer specific requests. You can visit our websites without disclosing your identity. In any case, data will be collected in log files, via search engines and in forms. The legal basis for processing the data is Art. 6 (1) sentence 1 lit. f of the General Data Protection Regulation (GDPR). Our legitimate interest follows from the above-listed purposes of data collection. Under no circumstances will we use the data collected in order to draw conclusions about your person. This data remains stored until it is automatically deleted. The data will be deleted when the above-mentioned purpose no longer exists. You can send us general enquiries using the contact forms provided on our website. A valid e mail address or telephone number must be provided so that we can respond to your enquiry.Any other personal data, such as your name, address or telephone number is not collected unless you voluntarily disclose this information. This data is collected in order to know who the enquiry originated from and to be able to answer it using your preferred channel (post, telephone or e mail). Data processing for the purpose of contacting us is based on Art. 6 (1) sentence 1 lit. a GDPR on the basis of your voluntary consent or on the basis of Art. 6 (1) lit. b GDPR and/or to safeguard our legitimate interests pursuant to Art. 6 (1) lit. f GDPR. It is our legitimate interest to be able to respond to customer enquiries and to thereby ensure functioning customer service. The personal data which we collect when the contact form is used will be deleted after your request has been dealt with, unless we are obliged to store it for a longer period of time pursuant to Art. 6 (1) sentence 1 lit. c GDPR because of storage and documentation obligations under tax and commercial law. We believe in transparency and strive to provide the best standard of service in the packaging industry. That is why we ask customers to rate us and comment on their experience on independent third party websites.Your feedback helps us to monitor our service delivery and customer satisfaction. It also alerts us if things have gone wrong, so that we can put things right where possible. It helps to keep customer service highly transparent and visible, and every positive ‘5 star’ feedback motivates our team. In order to invite you to review us, independently, we pass on your email address and transaction reference to Trustpilot, 1 St Martin’s Le Grand, 7th Floor, London EC1A 4NP, Tel. 0203 889 8444. According to GDPR, such data processing is also lawful as our legitimate interest on the basis of Art. 6 (1) lit. F thereof. Your personal data will be passed on to third parties to the extent permitted by law and required pursuant to Art. 6 (1) sentence 1 lit. b GDPR for the purpose of maintaining contractual relationships with you.This includes, in particular, the transfer of payment data to payment service providers or banking institutes in order to carry out payment transactions. These third parties are not permitted to use this data passed on to them for any other than the aforementioned purposes. If you wish to purchase against invoice, we will require an account application, and obtain credit information from Risk Disc (Experian) and a decision will be made based upon the outcome of the reports. Once a decision is made, invoices will be sent upon the dispatch of your order with a standard 30-day payment window. Failure to pay within the 30-day contract unless otherwise agreed will result in future orders being put on hold until satisfied. When you pay by credit card (Visa/MASTER Card), the payment data which you enter will be recorded and stored and not passed on to any company other than those involved in the payment process.When paying by credit card, you accept the payment provider’s Terms and Conditions. We will not collect or store payment data in this case. Data is processed for the purpose of payment processing. We always strive to ship your items within a 7-10 working day turnaround.Your personal data will be passed on to third parties to the extent permitted by law and required pursuant to Art. 6 (1) sentence 1 lit. b GDPR for the purpose of maintaining contractual relationships with you. This includes the transmission of data to the shipping service provider. Data is processed for the purpose of shipping your order. Cookies do no damage your device, nor do they contain viruses, Trojans or other malware. We use the so-called session cookies in order to recognise that you already visited certain pages of our website. Other cookies remain on your device for a certain defined period of time. Data processing by cookies is necessary for the above-mentioned purposes in order to protect our legitimate interests and those of third parties pursuant to Art. 6 (1) sentence 1 lit. f GDPR. Most browsers accept cookies automatically. However, you can configure your browser so that no cookies are stored on your computer or a message always appears before a new cookie is generated. However, complete deactivation of cookies can mean that you will not be able to use all of the functions of our website. Like many other providers, Custom Tape LTD also uses various methods to analyse the use of our websites. The tracking and targeting measures listed below and used by us are carried out on the basis of Art. 6 (1) sentence 1 lit. f GDPR. We use these tracking measures in order to ensure a requirement-compliant design and the continuous optimization of our website. On the other hand, we use the tracking measures in order to statistically analyse the use of our website and to evaluate it for the purpose of optimizing our offering for you. The targeting measures used by us are designed to ensure that you only receive advertising on your devices that is oriented towards your actual or assumed interests. These interests are to be deemed to be legitimate within the meaning of Art. 6 (1) sentence 1 lit. f GDPR. The respective data processing purposes and data categories are described in the corresponding tracking and targeting tools. This website uses Google Analytics, a web analysis service of Google Inc. (‘Google’). This is an effective tool for evaluating and marketing our website. Google may also forward this information to third parties if this is required by law or if third parties process this data on behalf of Google. Under no circumstances will Google associate the IP address with other Google data. As an alternative to the browser add-on, especially for browsers on mobile devices, you can also prevent Google Analytics from collecting data by clicking this link. This will set an opt-out cookie which will prevent your data from being recorded when you visit this website. The opt-out cookie is only valid in this browser and only for our website and is stored on your device. If you delete the cookies in this browser, you must set the opt-out cookie again. This website uses the remarketing function of Google Inc. (‘Google’).The purpose of this function is to present interest-based advertisements to visitors to the website as part of the Google advertising network. The visitor’s browser stores cookies that enable recognition of the visitor when visiting websites that belong to Google’s advertising network. These pages can then present advertisements to the visitor relating to content previously accessed by the visitor on websites that use Google’s remarketing function. This website uses no remarketing services currently. • pursuant to Art. 77 GDPR, to complain to a regulatory authority. For this purpose, you can generally contact the regulatory authority responsible for your usual place of residence or workplace or our company’s registered office. If your personal data is processed on the basis of our legitimate interests pursuant to Art. 6 (1) sentence 1 lit. f GDPR, you have the right to object to the processing of your personal data pursuant to Art. 21 GDPR in as far as the reasons for this are based on your specific situation or if you object to direct advertising. In the latter case, you have a general right of objection which we will implement without the need to specify a particular situation. 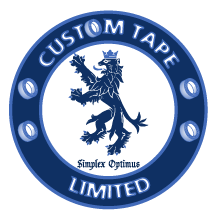 For any data protection matters simply email sales@customtape.co.uk with subject of Custom Tape LTD Customer Data Request. We reserve the right to require proof of identity before responding to such requests. Please remember that transmitting information and data over the Internet always poses a security risk. We have therefore implemented technical and organizational measures to protect your personal data. These measures protect your data from unauthorized processing, loss, as well as unauthorized alteration and unauthorized access. Our security measures are continuously improved in line with technological developments.Our website is protected by SSL and HTTPS secure connection. Updates of and amendments to this privacy statementThis data protection declaration is currently valid and has the revision status as per version 1.0.1. Due to the further development of our website and offerings on this website or due to changed legal or official requirements, it may become necessary to revise this privacy statement. You can view and print the latest version of this privacy statement at any time on the website. • Meet the needs and expectations of other interested parties. The company shall comply with Data Protection Guidelines issued. “data subject(s)”, “personal data” and “sensitive personal data” have the meanings defined within the Data Protection Act. This policy, supporting policies and procedures will be subject to periodic internal audit and may be subject to external audits as necessary by the Information Commissioner. Staff may raise concerns relating to the handling of their personal data, either with their line manager or Human Resources, or formally through the Business grievance procedure. The Business recognises data subject’s rights to raise a Subject Access Request. A formal request from a data subject for information that is held must be made in writing. All personnel are required to play an active role in the protection of company assets and treat information security appropriately in order that this purpose can be achieved. The Heads and Directors will be responsible and have authority for communicating and implementing this policy, supporting policies and procedures within their area of responsibility and will ensure individual accountability. This Policy and the business performance in meeting its requirements will be monitored and reviewed as a minimum, on an annual basis. Cookies are small text files placed on your computer by websites or sometimes by emails. They provide useful information to companies, which helps in all sorts of ways. For you, it means you can use the site more efficiently and save time by not having to re-enter your details each time you visit. They also make sure you receive the most relevant information from Custom Tape Ltd. For us, cookies help us to analyse how our customers interact with our sites so we can make improvements.